Wayne Fontana took his name from the drummer D.J.Fontana and not his record label as is sometimes supposed. He and his group, the Mindbenders, were one of the many talented acts to come out of Manchester during the 1960s 'beat boom'. Wayne was an accomplished R&B singer and soon gained a useful following of female admirers in the north of England. The band had immediate chart success with their first single, but its lowly #46 position and the failure of its follows up were disappointing. However, their fifth and sixth releases made the top 5, though 'Game Of Love' was held back from the top spot by 'I'll Never Find Another You' by the Seekers. 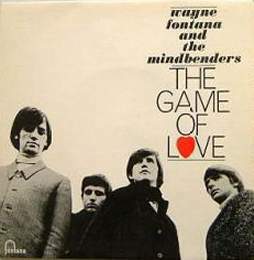 The 'Game Of Love' EP shown here is possibly the easiest to find of the group's output on that particular format. It bears the catalogue number TE17449 and carries an unusual mixture of material. Along with both sides of their best selling single- from which it gained its title- it also has "She's Got The Power" and "One More Time", which are tracks that don't appear on any of their UK singles issues. Sadly, by the end of 1965, although the hits had continued, Fontana decided to go solo. This appears not to have done him too much harm because he managed to achieve four more hits without the aid of his former backing musicians. However, he faded from the scene rapidly after 1968 and although he continued on the club rounds he fell into obscurity for many years. Fortunately, after putting personal problems behind him, he was persuaded out of his retirement during the late 1980s and can still be found at 1960s nostalgia concerts occasionally. Fontana TF418 1963 For You For You/ Love Potion Number 9. Fontana TE17421 1964 "Road Runner"
Fontana TE17453 1966 "Walking On Air"